You know how most people set goals for themselves, like run a half marathon, write a book, or get a promotion. Well my summer goal is to pick up a new vegetable at the farmer’s market each time I visit. Perhaps not as impressive as writing a book or running a half marathon, but arguably more delicious than either of the two combined. So, I’m stickin’ with it. 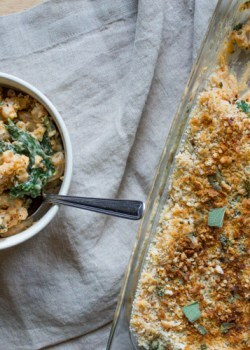 I’m also stickin’ with dandelion greens. These bad boy greens are packed with vitamins A, C, antioxidants, and contain 15% of your daily value for calcium. And they’re super versatile – throw ’em in a salad, with eggs in the morning, on a sandwich, in a pasta dish, or enjoy them simply sautéed. They are on the more bitter end of the spectrum so try pairing with more rich flavors to offset the bitterness. These greens are often used in Italian cooking and my Italian great-grandmother used to go out in her backyard to pick the “weeds”, aka dandelion greens for dinner. 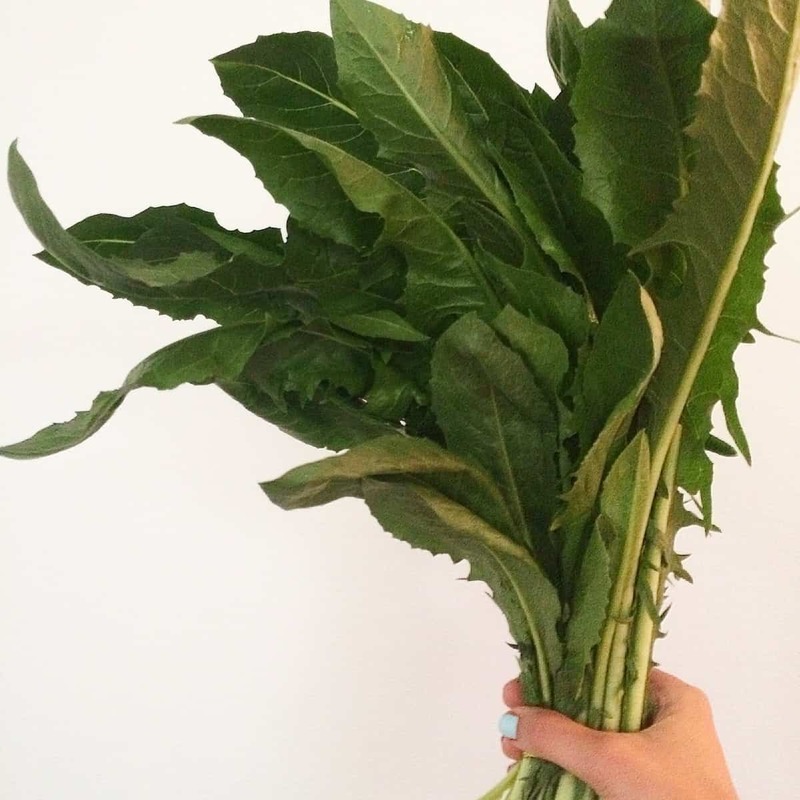 As you may have guessed, I picked up dandelion greens from my last trip to the farmer’s market. 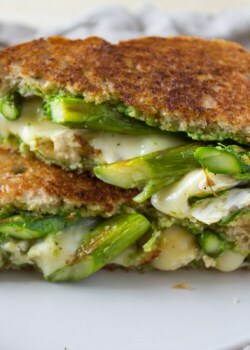 I got my dandelion recipe inspiration from the grilled cheese trend sweeping the food truck nation. 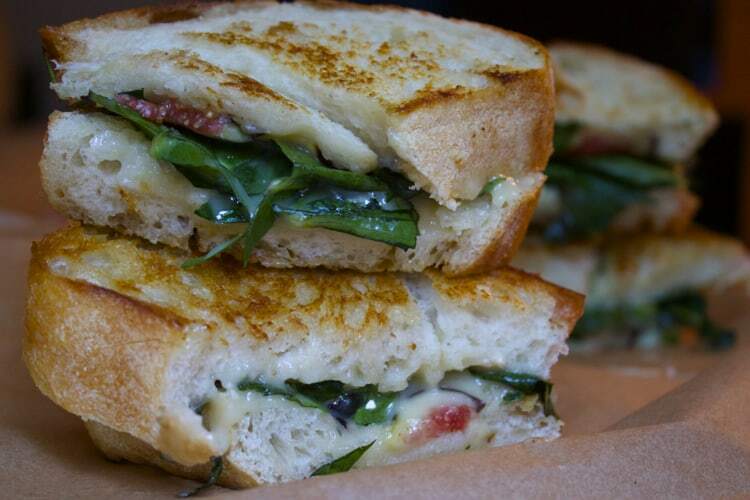 Seriously, grilled cheese food trucks and brick n’ mortars are popping up like whoa. And I’m totally down for the ride. 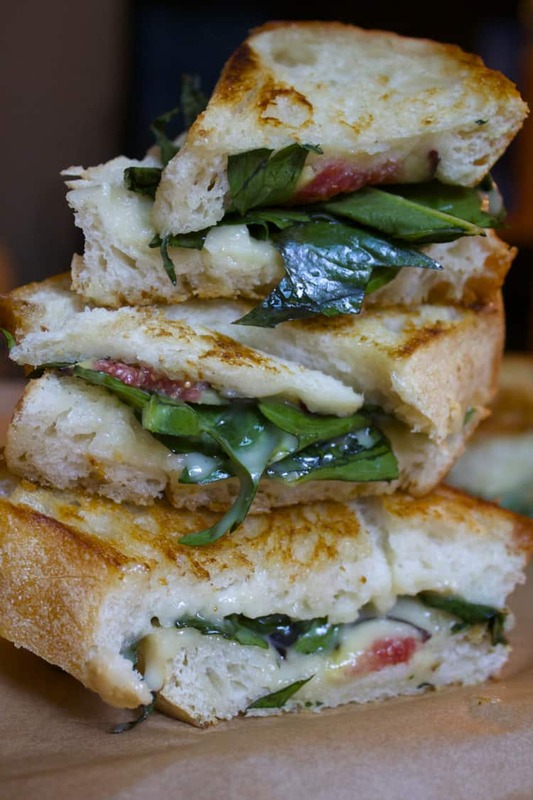 I love when these grilled cheese joints use seasonal veggies and interesting pairings to come up with a rockin’ veggie-filled grilled cheese. So, I grabbed some rich cheese (brie – my all-time fav), figs (also in season this time of year), and the greens and got to grilling. Heat 1 tbsp butter in a cast iron pan over medium heat. 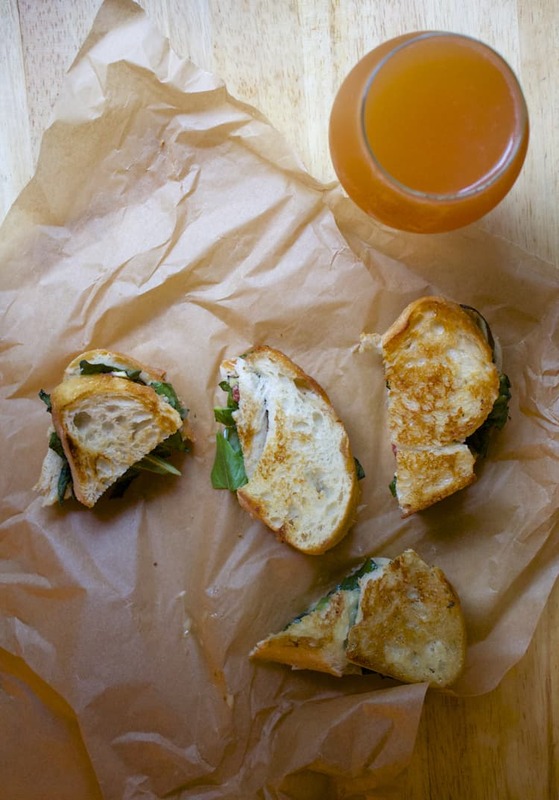 Divide the brie, dandelion greens, figs, and honey between two slices of bread. Top with the remaining slices of bread and place into the cast iron. Cover and cook for about 3-4 minutes (or until bread is lightly golden) on one side. Then flip the sandwiches to cook on the other side for about 2-3 minutes, or until the bread is lightly golden and the cheese is melted. I recommend using whole-wheat sourdough bread if it’s available to you. 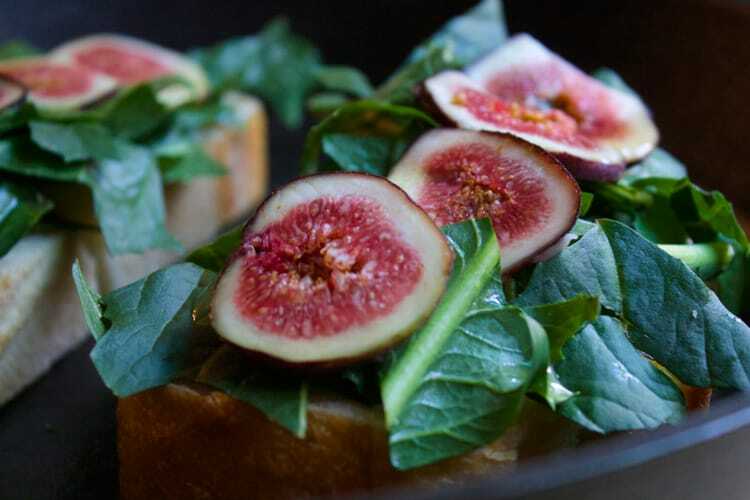 I’ve never tried dandelion greens but I adore figs and brie so this will be a great way to try them out. I like how you’ve included a range of contrasting flavors (sweet/bitter/salty) here! Thanks, Lauren! Let me know what you think when you try them! Great goal! Bitter greens + sweet fig=yum! Thanks Serena! It was an awesome flavor combo. Next summer can’t come soon enough so I can make it again! This looks awesome…so creative to use figs! Thanks, Danielle! I thought of fig jam at first and then figured why not just go for the real deal? You had me at figs..Mmmm! xoxo Sarah Grace, Fresh Fit N Healthy. Figs get me every time too. Thanks, Sarah!